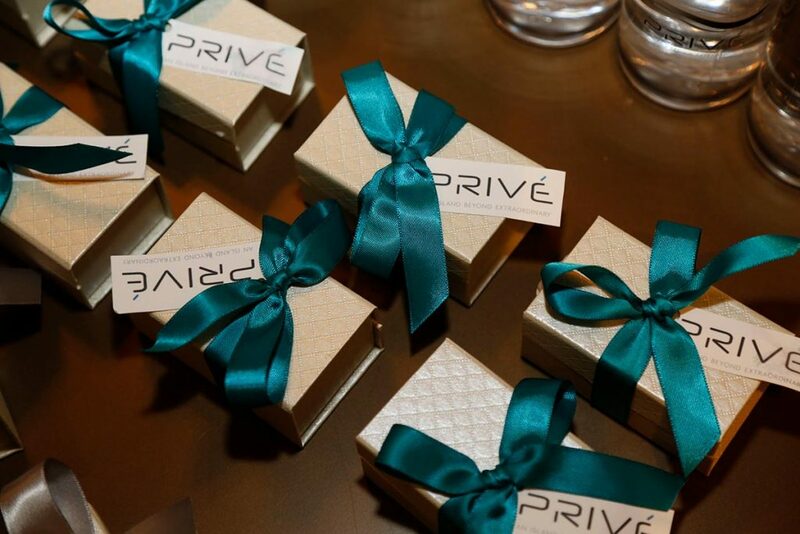 Privé Developers and BH3 held their 2017 holiday party on Privé Island in celebration of recent receipt of the project’s TCO, December closings and completion of the north tower social spaces. Complete with stunning Interiors by Steven G. and artwork by world class artists including Australian sculpture and designer, Matthew Harding, contemporary Spanish-American artist, Domingo Zapata, renowned American painter, Ross Bleckner, internationally recognized photographer, Cara Barer and many others. From the impressive lobby with stunning views, sweeping patios to intimate spaces like the tower’s spectacular wine room and cigar lounge, Privé offered the perfect backdrop for holiday festivities. Delicious Peruvian-Asian inspired hors d’oeuvres and light fare were varied and plentiful and cocktails were served on the wide balcony overlooking the bay and the lights of Miami Beach. See photos from the night of celebration below. For more information on Privé, contact a sales executive at (305) 440-4397 to schedule a tour. Privé® is located on an eight-acre private island set between Williams Island and Sunny Isles Beach. The twin iconic 16-story towers designed by renowned architects Sieger Suarez, will be comprised of a total of 160 ultra-luxury residences ranging in size from 2,585 square feet to more than 9,500 square feet for select penthouse units– the pinnacle of Miami luxury real estate. Every Privé residence will feature private elevator entry, flow-through floor plans with 10-foot glass on both eastern and western exposures, full 10-foot-deep balconies, expansive east/west water views throughout, European kitchens and bathrooms, as well as outdoor summer kitchens. First-class, resort-style amenities and services include a 10,000-square-foot gym and spa in each tower, private dining and social rooms, poolside café, wine and cigar rooms, kids’ rooms, tennis court, two pools and Jacuzzis, marina, private pier, jogging path, 24-hour gated entry and roving security, and full-time concierge.